The month of May this year is National walking month and this presents a great opportunity for us to undertake a sponsored walk (or a small section of the walk) around the district. Our walk will take place on Saturday the 18thMay covering 23 miles from Rochdale to Bacup, on to Todmorden and finally returning to Rochdale. I understand few members will want to complete the walk in it’s entirety but I do want all brethren to feel able to take part in some capacity. Inclusiveness is hugely important and there will be a role for everyone. Provide light refreshments (tea / coffee / water) in Todmorden or Rochdale. Backup / support vehicles with water and first aid equipment will be provided. High visibility clothing will be provided. 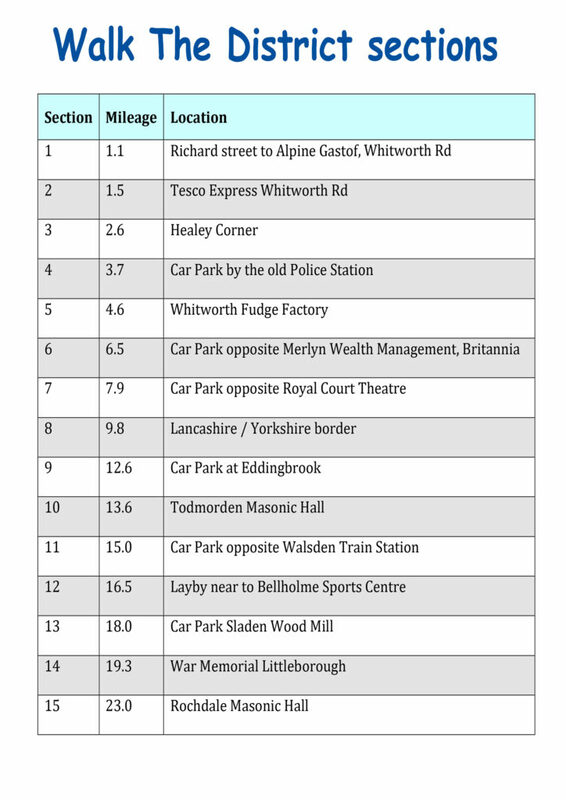 It is intended to erect the district gazebo in advance of walkers arriving at places of high footfall e.g. Bacup, Todmorden, Littleborough. Individual donations will be most welcome too. Of course I will keep you informed as planning develops. Also please see and share the attached flyer. Many Thanks for your help and assistance.